These tender slices of meat in gravy are designed specifically for small dogs and formulated to meet 100% of their nutritional needs. Made with high quality protein that is easy to digest, they also provide a source of moisture, which helps maintain urinary tract health. Now you can add more diversity to your small dog's meals by picking up our convenient variety 12-pack! Feed 2 1/2 trays daily per 4.5KG (10LB) adult dog. 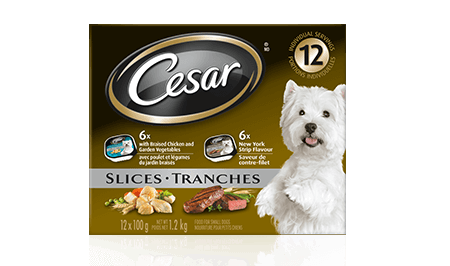 CESAR® Slices with Braised Chicken and Garden Vegetables is formulated to meet the nutritional levels established by the AAFCO Dog Food Nutrient Profiles for maintenance. CESAR® Slices New York Strip Flavour in Sauce is formulated to meet the nutritional levels established by the AAFCO Dog Food Nutrient Profiles for maintenance. Chicken & Vegetable: CHICKEN, LIVER, BEEF, MEAT BY-PRODUCTS, WHEAT GLUTEN, STARCH, WHEAT FLOUR, PEA FIBRE, MINERALS, PEAS, CARROTS, SALT, SODIUM TRIPOLYPHOSPHATE, COLOUR, VITAMINS, GRILLED CHICKEN FLAVOUR, GUMS, SODIUM NITRITE (FOR COLOUR RETENTION), SUFFICIENT WATER FOR PROCESSING. New York Strip: CHICKEN, LIVER, BEEF, MEAT BY-PRODUCTS, WHEAT GLUTEN, STARCH, WHEAT FLOUR, PEA FIBRE, MINERALS, SALT, SODIUM TRIPOLYPHOSPHATE, COLOUR, VITAMINS, NEW YORK STRIP FLAVOUR, GUMS, SUFFICIENT WATER FOR PROCESSING.